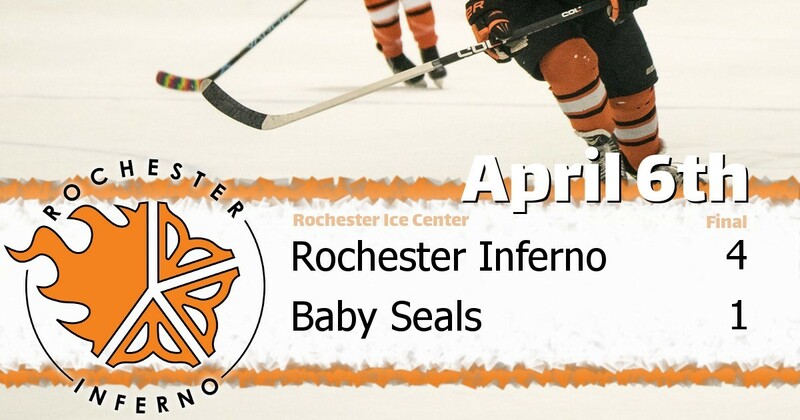 ROCHESTER ICE CENTER, April 6, 2019 - The visiting Rochester Inferno (D) took on the Baby Seals (D) in a 2019 Spring Classic matchup on Saturday. The Inferno defeated the Seals 4 to 1 at Rochester Ice Center. This was the 31st match-up between these two teams, and their last matchup was won by the Baby Seals 5-3. The Baby Seals lead the series 21-9-1. The Rochester Inferno had 7 players that made the scorecard. Tim Daly had 1 goal and 1 assist (2 points). Tim Moynihan had 2 assists (2 points) and was whistled for 2 penalty minutes. Pat Whitman had 2 assists (2 points). Jay Scott had 1 goal and was whistled for 2 penalty minutes. Jon Gunn had 1 goal. Kevin Brolly had 1 goal. Joe Climek had 1 assist.